You will never be forgotten by us David. We will always remember you and keep your family in our prayers. We miss you brother. Honor First! I have fond memories of us at Sabold Elementary, and spending time together with friends into high school. Remembering you at my birthday parties, sleep overs, and the ruckus caused by young boys. Remembering your coal black hair and dark eyes.. Always a smile or grin on your face, such a pleasure to share laughs and good times with... Snap shots in my mind like that from a view finder. I felt I had been stricken a physical blow when I heard about your passing. Having lost another child hood friend both of us knew at an early age, this is yet another tragic, tragic loss. To those who knew him, please keep his memory alive and speak kindly of him in passing. My condolences to the Tourcher family. Another year has passed and you are still admired and respectfully remembered in the hearts and minds of so many. My thoughts and prayers are with your loved ones and friends on this anniversary of your EOW. You will never be forgotten. 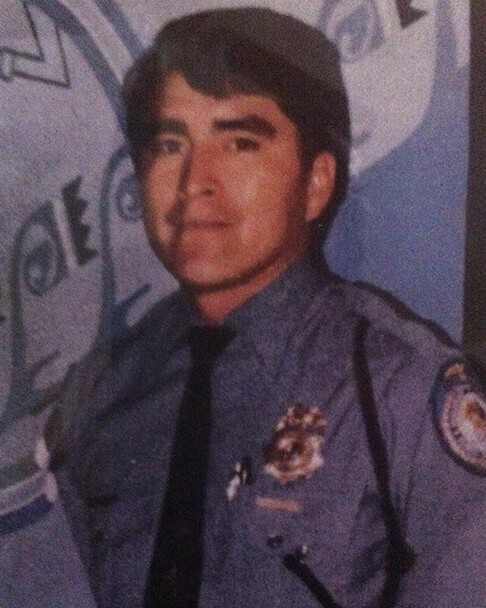 My thoughts and prayers are with your loved ones and friends on this anniversary of your EOW. Continue to keep watch over them and those still out on patrol watching over the Thin Blue Line. You will never be forgotten. Your heroism and service is honored today, the second anniversary of your death. Your memory lives and you continue to inspire. Thank you for your service. My cherished son Larry Lasater was a fellow police officer who was murdered in the the line of duty on April 24, 2005 while serving as a Pittsburg, CA police officer. Time never diminishes respect. Your memory will always be honored and revered. Although I only knew Dave briefly, I will always remember him as a truly kind, smart and welcoming person. He always seemed like he was two steps ahead of everyone, which I'm sure made him a great officer. I'm sorry for my belated message to you all, but I hope it shows that ANY fallen officer is never forgotten. I learned of Dave's passing well after the fact, and I'm sorry that I was not there to pay my respects to an old friend, and fellow Officer. I am sure that the short time that he served was carried out with honor and integrity. I am very sorry for your loss. My thoughts and prayers go out to all of you. David will always be in our hearts. I am looking forward to riding in Dave's honor in this year's Police Unity Tour, chapter 1. To Dave's mother, it has been a pleasure conversing with you via email. Thank you for sharing your reflections of your son with me. God bless and I will see you in DC. Officer Tourscher your work on this Earth as we know it is done. You are in God's Hands now brother. May you rest in peace. To respond to calls unknown. He drives a marked patrol car. A police officer he is known. To make it safe on the streets. 'Cause a waitress has his salary beat. 'Cause he works all year round. At his home he cannot be found. The one whos blood runs blue. To some he's just a fool. In this world of drugs and crime. 'Cause the crooks don't get any time. He prays to God above. So I can see the ones I love. He's alone down this ole' highway. It's just a little traffic infraction. And his badge is shining bright. When a shot rang through the night. Striking the officer in the chest. Each officer a bullet-proof vest. So he lay on the ground bleeding. His blood wasn't blue - His blood was red. 'Cause in a moment the officer was dead. Of how this officer had died. But those who loved him cried. With his badge pinned on his chest. He died doing his best. Dave, on your graduation day from the Academy, little did I know that would be the last time that I would see you. We spent many hours on the range and in the classroom together, and as your personal coach, I saw your determination and willingness. Your respect and your friendship meant a lot to me. Now, as I instruct trainees in 725th session of the US Border Patrol Academy in weapons, your ultimate sacrifice continues to influence, through me, those who are choosing to follow in your footsteps. It is said that what we do here on earth will be echoed in eternity, that one life can influence many. Great men raise from a humble state, because they choose a way of life normal men would run from. Dave, you are counted among the hero's. Sleep now until you hear your name read from the Book of Life. Happy Birthday Dave! We miss you so much but we know you're up there looking out for each and every one of us. There are no words that can express the influence that you have had on my life and the lives of those around you. You truly are the most selfless, sincere, and respectful person that I have ever known. I am honored to have had the opportunity to spend time with you and more importantly, I am honored to be one of your friends. Not a day goes by that I don’t think about the times we shared and how much better of a person I am for knowing you. You are an inspiration to your family and friends and hero to this country. You will never be forgotten on this day or any other. Much love. I come to the ODMP often to remember my late fiancé Dennis. Everytime I come here it breaks my heart to know that yet another officer has fallen and that yet another family has to live their lives without the man they loved. My heart goes out to everyone who knew and loved Agent Tourscher. Know that you are not alone in the "journey" that you walk. Should you ever need anything please don't hesitate to contact me. The Davis Co. Sheriff's Office in Iowa will always know how to reach me. You will be in my thoughts. From reading the reflections left for David, he sounds like he was a great man with a beautiful spirit. Those of you who knew him in life were so blessed to have been able to share in it. I hope that you will all continue to find a way to celebrate and remember David's life and the MAN that he was. Remember that David's life was about so much more than the way he died. David will continue to live on as long as we continue to remember him. Agent Tourscher, thank you for helping to make this world a little safer for us all. YOU will not be forgotten. Please continue to watch over all of us as only you can. If you happen to bump into my late fiancé Dennis up there give him a big hug for me and the kids. It's been four years but we still miss him terribly. You were one of the most wonderful people that I have had the privledge of knowing. There are not words enough to say how greatly you are missed and loved. I just learned today of Daves death. I am upset it took me this long to learn of his passing. Dave was a great man. I met Dave in the 2002 during our fall semester at Kutztown. Dave was a very good friend and someone that you always wanted to be around. I lost contact with Dave after a year of both of us living out of the Country. I always enjoyed seeing him and talking to him. He always wanted to work for the United States Govt and I am happy to learn he was able to do something he was passionate about. I will miss you Dave and know your in a better place. GOD BLESS YOU. Rest in Peace brother! Heart felt condolence to your family! Rest in peace, you will never be forgotten. You ever wonder, " What happen to the good old days when you got together with all your friend and had some fun." Now everyone has there own lives and it's hard to do that anymore. Living life to its fullest, that's what "Dave Tourscher" did. And we should all follow in his footsteps. This fishing trip is in memory of one of the best friends I ever knew. So cancel all your plans for the weekend of June 9th 2007 and come fishing with us. You've been working for a long time, repay yourself with a night or weekend out with friends. Occasion: "Celebrating our love for friends in Memory of Dave"
We are so sorry to here about your tragic loss of David. Our thoughts and prayers go out to you in support during this very difficult time. We know that sometimes there is little comfort that comes from words. Keep focused as you can on the memories and joyous times for these things may bring you comfort. Rely heavily on family, friends, and other law enforcement for support. Honor your fallen loved one, for their sacrifice will not be forgotten. Border Patrol Agent David Tourscher is a hero.